Stacey joined the School of Applied Social Sciences in 2013. She completed her ESRC sponsored PhD at the University of Leicester. She is a leading figure in the sociology of sport in the area of female sports fans. Her book, The Feminization of Sports Fandom: A Sociological Study, was published by Routledge in May 2017. Women’s experiences as sports fans have been largely ignored by academics but this book tackles these shortcomings in the literature and sheds new light on the many ways in which women become sports fans. The book looks at the growing numbers of women fans entering the traditionally male domain of the sports stadium and is the first study to focus on the phenomenon of the feminization of sports fandom. Stacey is especially interested in issues of gender and sport. 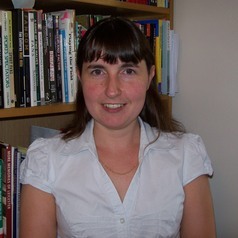 Her research to date has incorporated a number of areas including: the sociology of football and rugby union; comparative research in sports fandom; women, sport and place; rivalry and class distinction between sports fans; change and continuity in the lives of female sports fans; the meaning and importance of sport for women; and the formative experiences of females across different generations and the role of the family in shaping sporting involvement. Her research interests are interdisciplinary, incorporating sociology, history, sport and physical education, gender studies and leisure studies. Stacey’s current research agenda further develops her existing work in the area of female sports fandom. She recently began a three year AHRC project as principal investigator entitled: Female Sports Fandom in the North East: A Historical Study of Female Fandom and the Critical Intersections Between Sports Spectatorship and Participation (£243,710.04). This project runs until 2019 and is a comparative study of men’s and women’s sports in the North East of England.